Telpress NewsSlider is a turnkey news processing and distribution platform based on a lightweight client-less real-time news terminal specifically oriented toward full-screen and touch-screen devices including tablets, mobile phones and desktop touchscreen computers. The ultimate freedom to your news monitoring tasks. 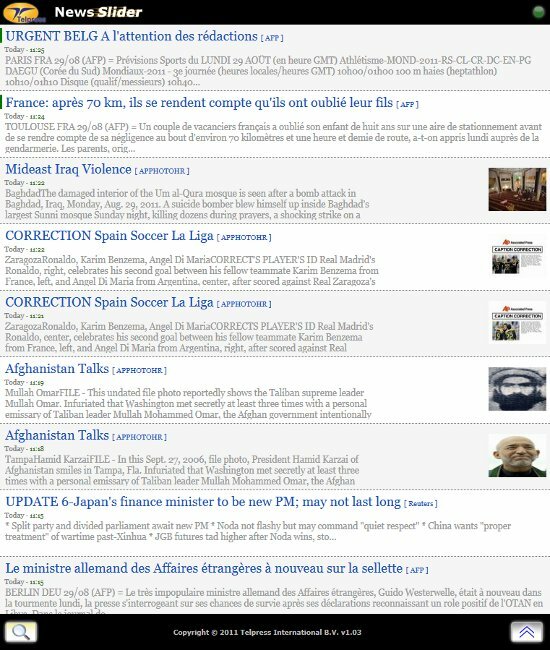 Telpress QuickNews Mobile Edition it's a powerful real-time news terminal available for mobile phones and smartphones. It integrates in your phone and runs also in backgroud mode providing visual and audible alerts.